On the front end of your community, moderators can moderate your site depending on the permissions that you have given them to do so. Moderation can be done at an item level, or the level of its container. For example you may moderate individual posts from the topic screen, or moderate topics from the forum screen. Whilst within a post or topic, if you hover over the topic or post you wish to moderate you will see a checkbox appear in the top right of that item. Selecting this will add this to the items that you are currently moderating. Once you have selected at least one item, you will see the moderation menu appear at the bottom where you can select the action you wish to perform. You can see this in action in the animation below. 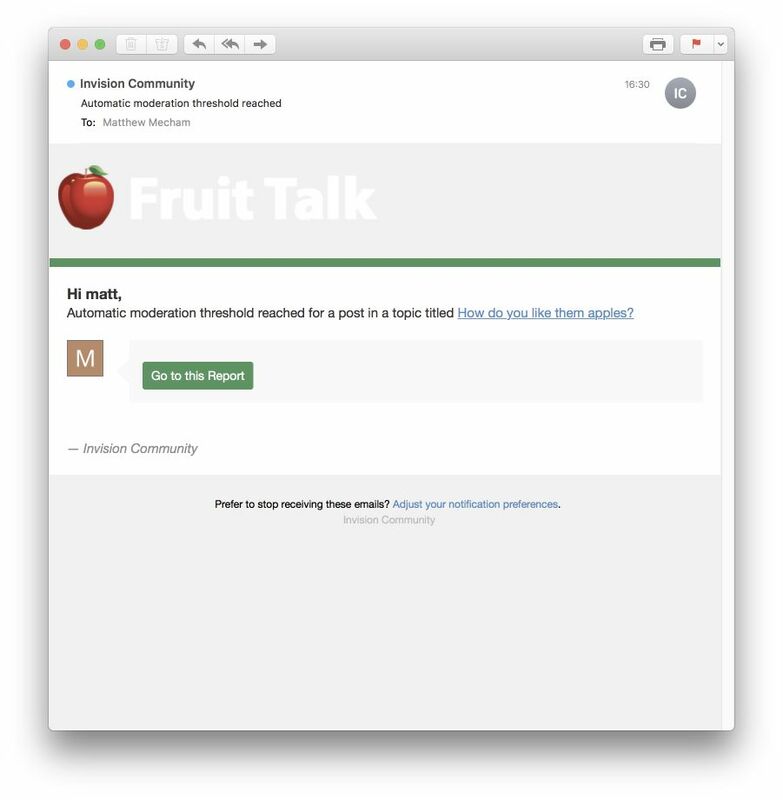 In some of the other areas of the community, you may find moderator actions under a button, such as you can see here in a gallery image. Within each item of content you will see a moderator actions menu. You can perform similar actions from here, and also see the moderation history for that particular item. Depending on where you are within the system, the moderation menu will show different actions. Below is another example where posts in a topic are being hidden from the end user. There comes a time when your community is so successful that it can be a little tough to keep up with all the content and reports. To help with this, you can make use of our automatic moderation feature, which performs actions when an item of content is reported by a user of your community. 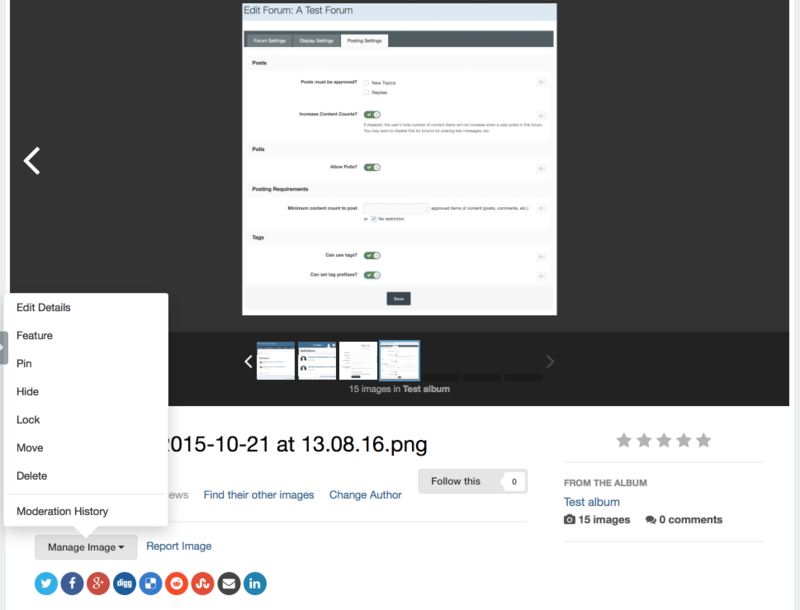 This feature leverages your member reports to automatically remove objectionable content from public view. You as the admin will define thresholds for the content. For example, you may say that to hide content, a post needs 5 reports. This reduces the workload for your moderators and enables you to crowd source moderation. When a member reports a piece of content, they now have the option to set a type, such as "Spam" or "Offensive". These options can count towards the threshold. Once the threshold has been passed the item is hidden. Before you can create your own rules for automatic moderation, you must create 1 or more report types from the following location. Once you have done this, you can then continue to setting up rules for auto moderation. A member with less than 10 posts only needs 5 reports to hide the content. But you may want to give more experienced members a higher threshold as there is more trust. You simply add a new rule: A member who joined over a year ago with over 500 posts needs 10 reports to hide content. You can do that easily with the rules system as it will scan them all and pick the one most suitable for this member. Once an item has received enough reports to match the threshold, it is automatically hidden from view. Meaning it can then be dealt with by a moderator at an appropriate time, without the reported post being an issue to your members. A notification is sent to all moderators who opt in for notifications. This notification shows inline in the notifications center. It can also optionally be sent via email for those who want to know without checking the site. Of course, a moderator may decide that the content is fine and un-hide it. Once a piece of content has been un-hidden, automatic moderation will not hide it again. The system will only count a unique member as one point towards the threshold. This is to prevent a single member can reporting an item 5 times, as they are only counted once towards the threshold. You can also set a time limit between reporting the same item. This will prevent a member reporting a single item multiple times in succession. Of course, the member can delete their report if it was in error.